Humanity has made sense of the earth by mapping it. We draw up maps representing where things are with relation to other things. This helps our memories and makes it possible to give better directions to others who might carry this representation of reality with them in a pocket. But helpful as they are, the maps are only virtual versions of the reality out there. In navigating as in life, you do better if your map (paper or mental) is an accurate reflection of what is really “out there.” The oldest extant map of the world, the Mappa Mundi in the Hereford Cathedral in England, is entirely drawn on one calfskin. It was probably drawn by clerics in England, but – or should I say therefore — it has Jerusalem at the center of the world. Like other representations of the world, known and assumed on only scanty real information, Hereford’s map is more a theological statement than a device for navigation. The twenty-first century has given us amazing powers for measuring and mapping our earth with accuracy which would have been unthinkable only a century ago. And yet the map of a location is not the same as the place itself. But don’t you sometimes wonder? The earliest boundary I remember crossing was on a drive from Illinois to Wisconsin. My parents told me we were crossing from one state to another. Did I feel the difference, right there at that tar strip across the highway? Uh, not really. But the interplay between mapping and the earth stuck with me. Years later I tried to mess with my children’s minds when we took them to see the Four Corners monument. It’s tempting to say it is in the “middle of nowhere” (except for the souvenir shops among the rocks) but it exists because it is Somewhere. 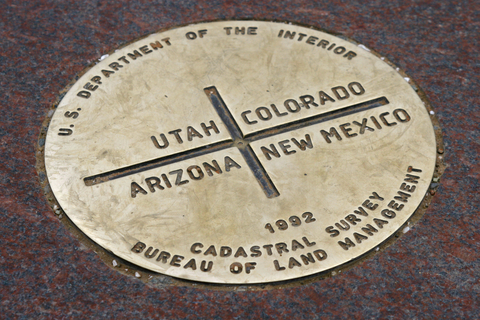 You can see its significance right there on the plaque with the big + etched to show where Colorado, New Mexico, Arizona and Utah come together at one point. Like everyone else, we took turns standing in all four states at once. Cartography met the earth, and we were there to experience it. 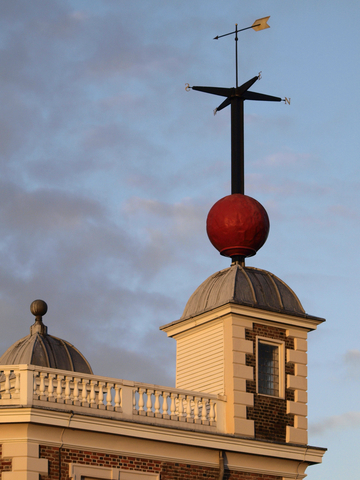 The red ball at the Royal Observatory drops at 1 PM daily to mark the correct time. This was the inspiration for the dropping ball in Times Square at New Years. In the same way I got a kick out of visiting the Royal Observatory in Greenwich which establishes the Prime Meridian for time keeping and mapping. On a hill looking down on the Thames, the courtyard paving had a section where it seemed the land was just scraped away to reveal (a-HA!) the brass rail which IS the zero meridian. I understand that now the brass rail has been replaced by stainless steel, and they have added a green laser which shines north from the building, indicating the location of the imaginary line from which all others are calculated. And there it is for you to see in case you doubt! Even those of us who love maps need to remind ourselves that the map is not the real thing. But it is fun to put ourselves in the very place represented by that X which marks the spot. This entry was posted in Travel, Uncategorized and tagged cartography, equator, four corners monument, International Date Line, Mappa Mundi, maps, Prime meridian, Royal Observatory Greenwich, travel. Bookmark the permalink.